In medium bowl, beat gelatin and 3 tablespoons cold water with whisk. In large bowl, mix Nutella™ and 1/4 teaspoon salt. In 2-quart saucepan, heat whipping cream and vanilla to boiling. Pour one-third of the cream mixture over gelatin mixture; mix with whisk. Pour remaining cream mixture over Nutella™; beat with whisk until smooth. Add gelatin mixture to Nutella™ mixture; beat well with whisk. Beat in milk. Divide mixture evenly among six 6-oz ramekins or custard cups. Cover; refrigerate at least 4 hours until set. When panna cotta is fully chilled, make marshmallow frosting. In medium bowl, beat marshmallow creme and softened butter with electric mixer on medium speed until blended. Beat in powdered sugar until smooth. To remove panna cotta from ramekins, carefully run offset spatula or thin knife around edge of each panna cotta. Dip bottom of each ramekin into bowl of very hot water 5 seconds. Immediately place serving plate upside down over each ramekin; turn plate and ramekin over, and remove ramekin. Spoon or pipe about 2 tablespoons marshmallow frosting on top of each panna cotta. Top each with 2 teaspoons crushed cereal. Store panna cotta, covered, in refrigerator. 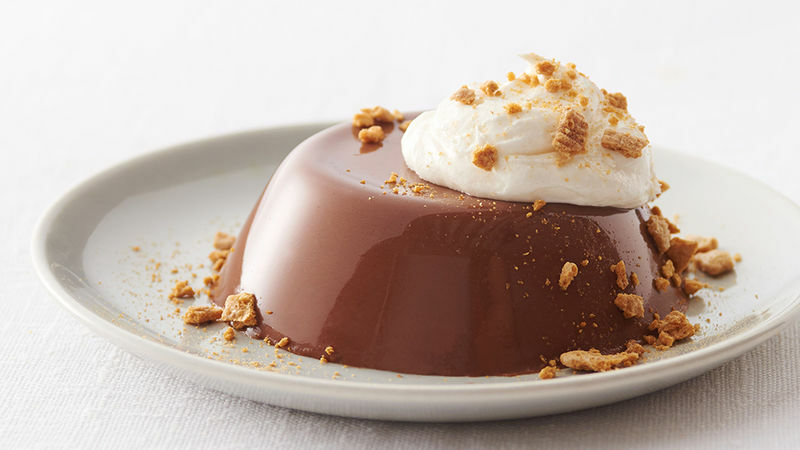 Keep panna cotta in cups, and top each with frosting and crushed cereal, if desired.